This is an unusual little vegan curry, one you won’t find on the menus of Indian restaurants. 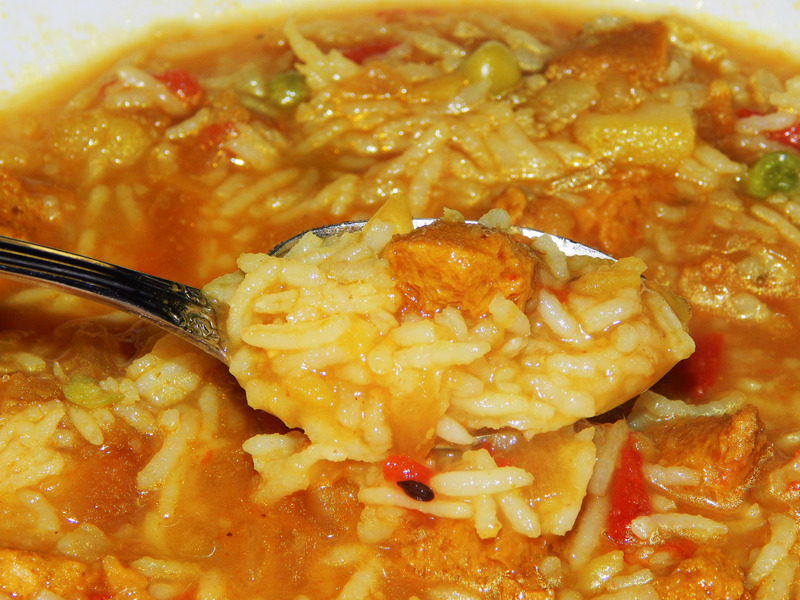 It tastes almost like a beef and potato stew in a rich onion gravy. Some people prefer it “dry” (without much liquid), to eat with bread. 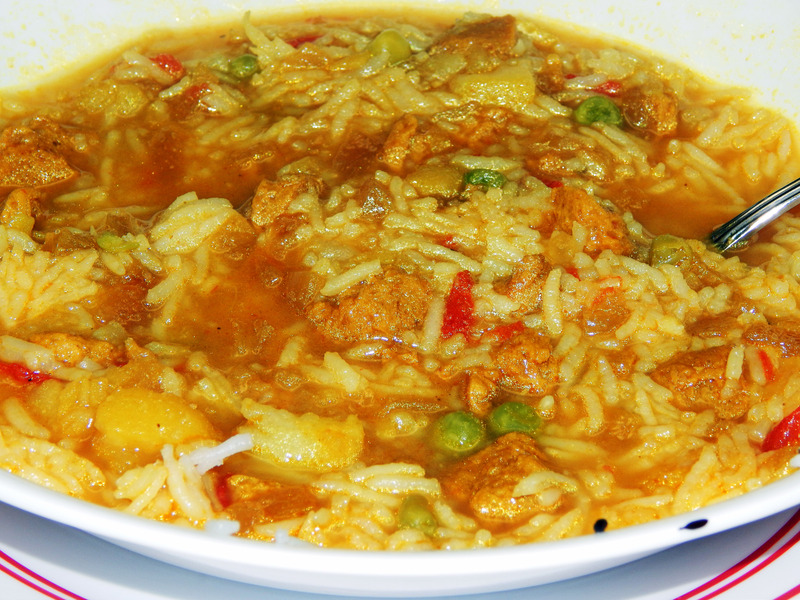 My partner and I prefer it wetter and “soupier,” to ladle over jeera rice. It’s classic comfort food – perfect for the coming autumn. Wash and peel the potatoes. Cut into chunks. 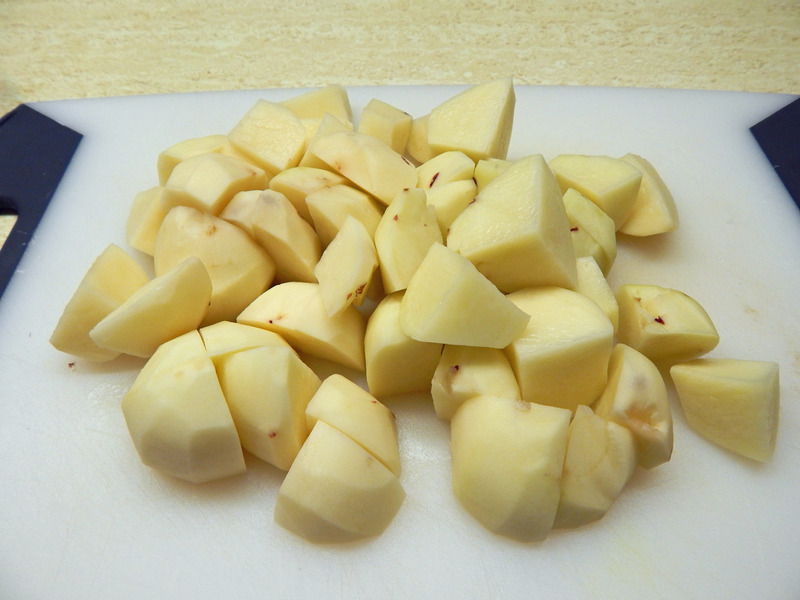 With red potatoes, I usually cut the potatoes in half, then half again – 4 chunks per potato. Rehydrate the Nutrela by placing in a bowl and covering with boiling water. Let sit for 10 minutes. Make the onion masala. In a large skillet, heat the vegetable oil over medium-high heat. Add the onions and chili peppers and cook, stirring occasionally, for about 10 minutes or until the red onions start to turn pink or the yellow onions begin to be translucent. Add garlic and ginger and cook for another 2-3 minutes. 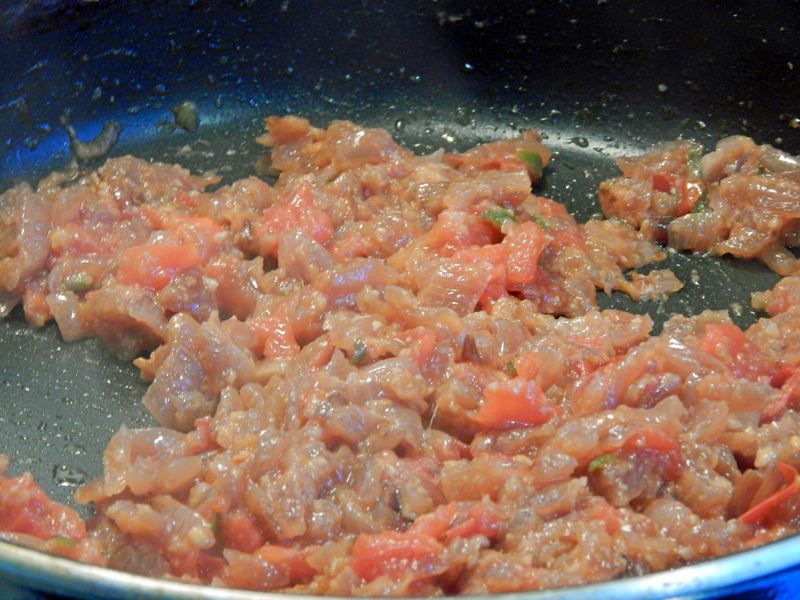 Add tomato and cook another 2-3 minutes. 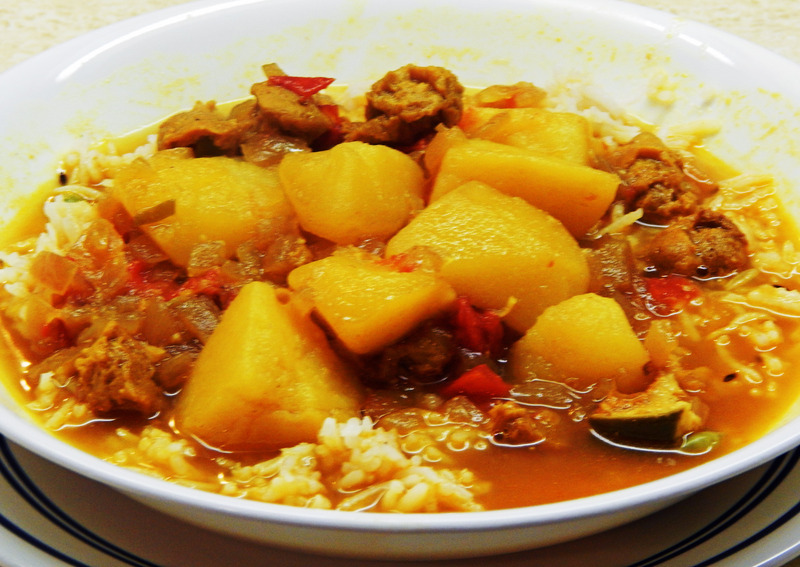 In a pressure cooker, combine the potatoes, Nutrela, and onion masala. Add about half a pressure cooker water if you want to serve over rice – otherwise, add just enough water to cover the potatoes. Add turmeric powder (careful, it will stain your clothes) and salt. Place lid securely on pressure cooker and cook on high heat for one whistle. Turn off heat and let sit for five minutes. 1 tablespoon of salt sounds like a lot, but with the potatoes and soy chunks, salt is needed! You can always add salt a teaspoon at a time. If you don’t have garam masala (many Americans don’t), try adding two scant teaspoons of curry powder when you add the salt and turmeric. This is definitely non-traditional but can be a tasty alternative. I’m going to try this one with soy curls! I’ve made a few curries so far with soy curls, but not yet using the pressure cooker–I hope they’re pressure-cooker friendly. I’ve got some curry leaves and hing that I need recipes for! Maybe you have some suggestions? Curry leaves and hing are more South Indian – and I cook mostly North Indian – but I’m sure I can find a few suggestions for you! Please let me know the next time you are in Charlotte! 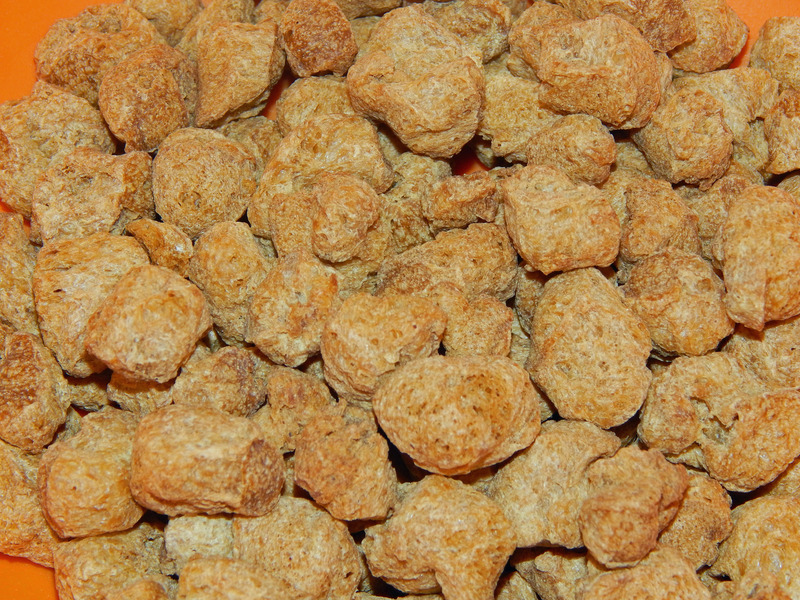 We’re soy-curl crazy and buy in bulk! I bought some curry leaves and hing recently on a whim and have yet to use them. I rarely use the pressure cooker for anything beyond beans, due to having woefully mushed most things I’ve tried so far. Heh. Have you checked out Eat Live Burp by one of my blogger friends? http://eatliveburp.net/ She’s got a number of South Indian recipes – and everything of hers I’ve tried has “worked”! Thanks… I’ll check her blog out!